Back in the "good old days" going to the local "five and dime" or general store was an occasion to get about and see your friends. It was the time for exchanging information about the happenings in the community and a chance to do commerce as well. Nowadays most communities are largely planned with huge retailing establishments designed for the quick walk from your car to the checkout stand without any personal exchange or friendly hellos. This adds to the feeling of isolation and lack of community identity over time. However, one of the things that makes SJC different is that because it is a small town with a deep sense of history, our downtown and general shopping areas, designed before the era of planned communities and power centers, provide a different experience. As a result, because so many of us know the local proprietors, we understand the need to shop locally and support their businesses. Many of our businesses are family operated and have been around for years, thus, we know they are working hard to survive and be successful. I know that I and many folks make a real effort to shop at DeNaults for the hardware items we need. Others support our restaurant community and still others purchase all their major business supplies right here in town. So next time you think about driving up to the power center or major discount store, think twice about the camaraderie your local shopping effort creates. Not only do you support the community in a variety of ways, look at shopping locally as a social event, and have fun. 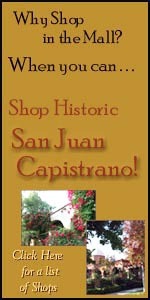 Located in the Costco Plaza between Mission San Juan Capistrano and the beach. Well stocked inventory of all popular Ford models along with their stock of pre-owned inventory. Financing and service also available. Hand made fairy costumes and fairy / angel wings. 20 years of Industry experience in the Artisan and Costuming business of making Fairy and Angel products. Entire selection of costumes, slippers, wands and accessories are available for online ordering. Bettina Knits are a unique collection of custom luxurious stoles, scarves, wraps, sleeveless jackets, and throws, made in the USA from impeccable quality imported European yarns. Each is hand fringed with shimmering metallics, and is available in over twenty rich colors. Bettina Knits are incredibly versatile, worn day or night, dressed up or down, and all year round. Toss one on in an air conditioned restaurant, theater, airplane, or while watching a brilliant sunset. They are custom made to order and come exquisitely wrapped in the signature black with gold ribbon. Sports Apparel inspired by the XTERRA multi-sport endurance events. Fulfillment and Marketing out of Dana Point. One of Southern California's premiere professional floral designers. Prooducing unique, creative and stylish florals for your wedding or special event and offering competitive prices without compromise to quality or personalized service. Come visit their adorable gift shop. Selling tea, beautiful tea sets, hats and many items for the most refined tea drinker. Also carry a full line of Red Hat items. In business since 1984 with it's signature concept of birds merchandised on suspended perches rather than caged. Their petting zoo environment is just one of the many things that Omar's have become famous for. Specializing in exotic birds ranging from cockatiels to macaws. Customers are encouraged to play with the birds while shopping. Services at Omar's include boarding & grooming.